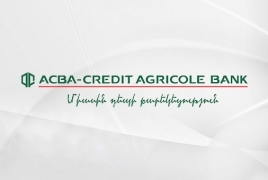 PanARMENIAN.Net - ACBA-Credit Agricole Bank will start on Thursday, July 12 placing coupon, non-documentary bonds worth $5 million and AMD 700 million, with an annual yield of 5.25% and 9.50%, 36 and 24 months of maturity period, respectively. The nominal value of one bond will stand at $100 and AMD 100,000, respectively. Under Armenia’s law on guaranteeing compensation of bank deposits, cash resources attracted via the bonds issued by the bank are considered bank deposits and are guaranteed by the Deposit Guarantee Fund of Armenia. To acquire bonds, investors should fill in relevant applications and submit them to ACBA-Credit Agricole Bank.